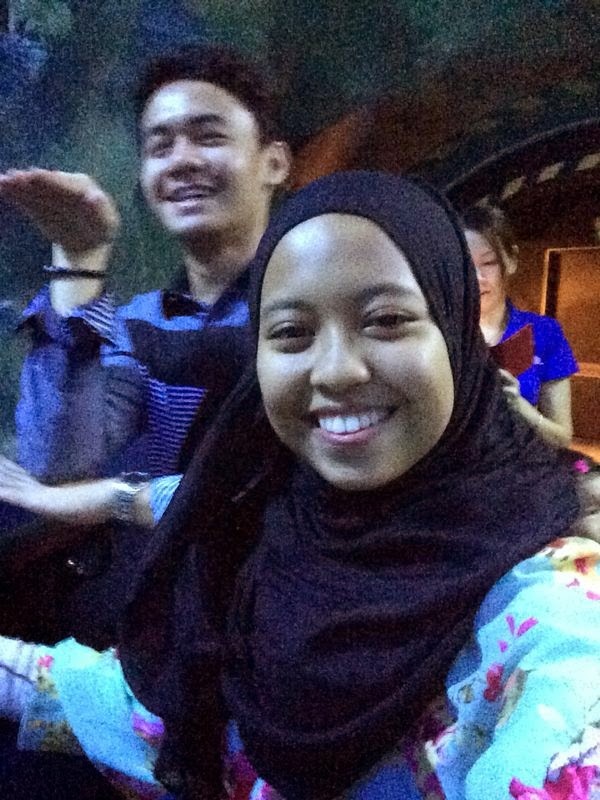 Well,last twenty eight o five twenty fourteen,i went for an Aquaria date with Ili. Naayhhh it wasnt really a date because there were four of us including Jia and Ili's lil sister,Sarah. So,at first i wasnt gonna follow them because Ili told me to ajak anybody in case i'd be like "krik krik" or something. So yeah,i decided not to come. Then suddenly Ili said something lupa dah apa benda then something crossed over my mind said "kalau aku tak gerak jumpa dia esok,tah bila pula dapat jumpa Ili ni". Then,tak kisahlah whatever it is,I'd be "Krik krik" ke apa ke,i dont wanna care i just wanna see her. (Hey,me and Ili,theres nothing between us okay. Just a closed friend.......,not to me). So we went there by train. Masa sampai kat KTM tu cam...awkward sikit (Just a little bit *with Dr. Sonya's sound*) sebab mula mula tak jadi nak ikut kan. So yeah. Then Jia arrived a minute after me. Then we bought tickets. Suddenly we saw Harith the director of #ngajok episodes,which is the one we almost ajak tapi canceled i dont know why. So yeah. Harith that day keluar dengan junior katanya. Sebelum sambung belajar. Bila dah masuk Aquaria tu i was waiting for Ili ajak selfie or something because i really really really wanted to take selfie with her so yeah skip.